What is a West Virginia Eviction Notice? West Virginia Eviction Notice: What Is It? If a tenant violates their lease or rental agreement in some way, the landlord or their authorized agent may issue a West Virginia eviction notice. Generally called a notice to quit, a West Virginia eviction notice informs the tenant that they’ve violated the lease. What Are the Components of a West Virginia Eviction Notice? The date the eviction notice was issued. The name of the tenant or tenants obligated to fulfill the lease or rental agreement terms. The address of the rental property, including the county where the property is located. The reason for the eviction notice. 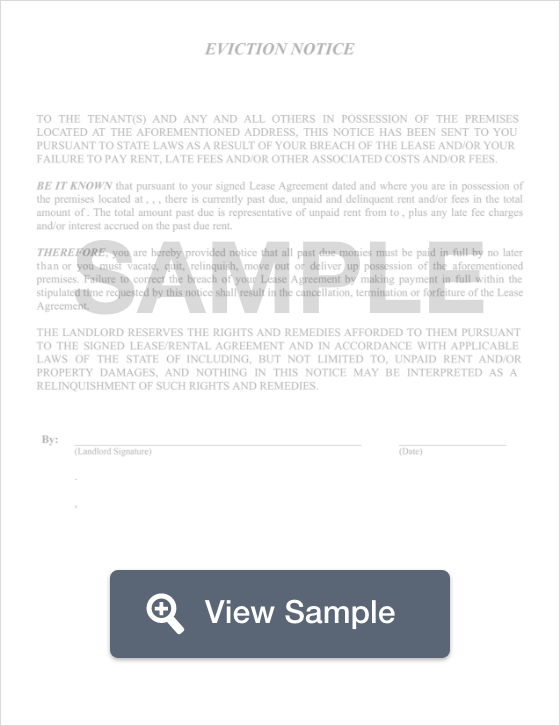 The signature of the landlord or the agent issuing the notice. West Virginia differs from most of the states because there is no real notice required for non-payment of rent, non-compliance with the lease or rental agreement, or for illegal or harmful activity. What this means is that landlords may immediately begin an eviction lawsuit against the tenant if they violate the lease in any way (§ 55-3A-1). When a tenant or a landlord wants to end a week-to-week tenancy, they can issue a one week notice to the other party according to § 37-6-5. If there is a month-to-month tenancy, the landlord or the tenant can, for any reason, issue the other a 30 day notice to end the tenancy according to § 37-6-5. What Are the Legal Considerations of a West Virginia Eviction Notice? Although landlords may immediately file a lawsuit against the tenant for an eviction, they must get a court order before they can change out the locks, shut off the utilities, or remove the property of the tenant from the premises. Additionally, landlords may not evict a tenant for reporting code violations or uninhabitable conditions to the housing authorities or evict the tenant because of their nationality, skin color, race, gender, disability, religion, or family status. If a landlord engages in an illegal eviction method, they may be sued by the tenant. The court could award financial damages to the tenant and fine the landlord for breaking state or federal law. The Attorney General has a comprehensive and easy to understand list of tenant rights on their website. There is no state law that says how much time a landlord must give you to pay late rent or otherwise correct a violation. If you receive a notice, read it carefully. Contact your landlord if you have questions. If you think that you’ve been victimized by an illegal eviction, contact a landlord-tenant lawyer to determine if you have a valid legal claim. You can also reach out to legal aid or a legal clinic being offered by a local law school to learn about what you can do to help yourself during the process. If you’re a West Virginia landlord, it is prudent to make an appointment with a landlord-tenant lawyer to learn about the eviction process as well as local housing laws. This can help protect you and your investment.